Cowtown's "TRUE GRIT" Video Premiere! Cowtown's "TRUE GRIT" Video Premiere Dec. 22nd • 9pm @ Sidecar Social Club 3243 N. 3rd St., Phoenix, AZ. 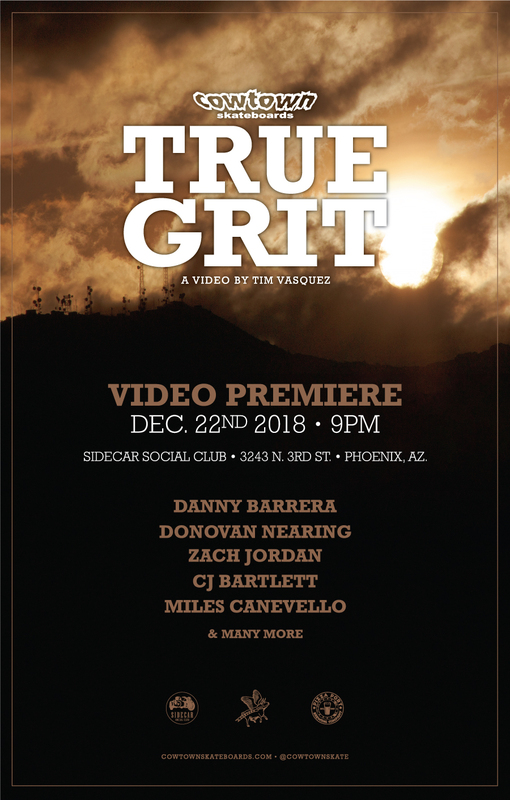 TRUE GRIT, filmed and edited by Tim Vasquez features Danny Barrera, Donovan Nearing, Zach Jordan, CJ Barlett, & Miles Canevello plus many more! Our good friend Nick Fiorini will be hosting the premiere at his establishment Sidecar Social Club located downtown Phoenix. Drink specials - $3 Pizza Port Beer 16oz & $4 draft all night. Come out and enjoy some Arizona Skateboarding with us!